I strongly agree about these idiotic "studies" that purport to benefit other species but really only enrich human knowledge about them, if anything. Since there is nobody regulating these "studies" (not that I'd advocate anything short of their abolishment) and no agency putting the kibosh on unnecessary or frivolous research, we don't even know that anything of value for the species OR for humans is being learned. It is high time we stop enslaving the natural world for our own entertainment and calling it "education". Wolves have been all but exterminated at our hands. Haven't they suffered enough? The only point in the commentary above I would disagree with is that wolves are "humiliated" by the collars. This is a human emotion borne of civilized ideas about how we should behave and has no relevance to the natural world. It is purely because the collars impede the wolves' ability to fully function that I think they should come off NOW. It happens that domestic dogs are sometimes accidentally strangled by their collars. I wondered how much this has happened to wolves and that's why I started my research. I should not have been surprised to find that apparently nobody has even bothered to ask the question, never mind attempt to answer it. 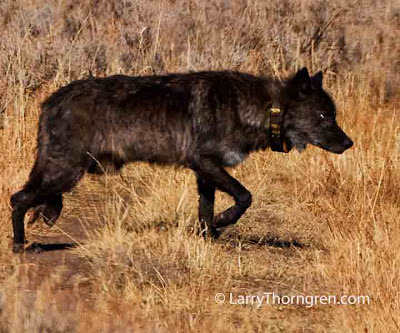 I am glad to have at least found this website where wolf tracking is being looked at with a critical eye. Thank you!